There are a lot of rumors about DJI products, but the vast majority of them are wrong or fake. The Phantom 4 Pro is due for an upgrade since it was released at the end of 2016, only 10 months after the initial Phantom 4. This unusually long life span for a DJI drone generates a lot of speculations. Forum experts and unverifiable sources have been forecasting the announcement of the new Phantom 5 within the “next few weeks” for more than a year now. However, this latest rumor is more consistent due to the leaked images and the identity of the source. A certain OsitalV, probably a Chinese citizen somehow linked to DJI or its supply chain, has already leaked very accurate information in the past. His sketch published in November 2016 about the DJI Zenmuse X7 proved to be remarkably accurate. He also was the first person to release a picture of the Mavic Air before the official announcement. The current "Phantom 5" images are consistent with his first sketches released on Weibo back in October 2017. On the other hand, we know very little about OsitalV and he often posts images labeled as “concepted” and gives contradictory information by saying that they are “personal wishes” or "predictions." According to him “DJI said that the leaked photo of P5 is a customized drone for designated users, not for sale” but the new round of images published a few weeks later comes with this comment "It's getting close." Good luck to sort the right information out of all of this. Regardless, the images show the familiar shape of a Phantom drone with an interchangeable lens camera and four different f/2.8 lenses: a 15mm, 24mm, 35mm, and 50mm prime. 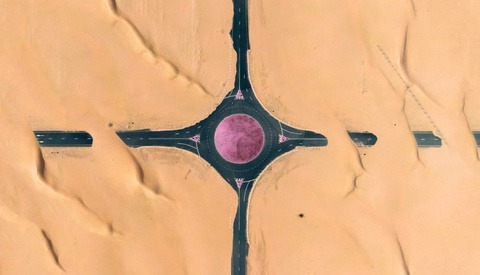 The focal is indicated in 35mm equivalent. One of the sketches claims that the sensor would be a one-inch CMOS like the one fitted on the current Phantom 4 Pro. Oddly, the sensor in the leaked image looks like a square but it’s hard to tell at this point. Moreover, OsitalV previously claimed that the new aircraft would offer some degree of rain resistance thanks to better weather sealing and deported motor cooling holes placed under the frame. The drone shell would ditch the traditional plastic design in favor of aluminum. That would be coherent since many Phantoms suffer from plastic fatigue and cracks, especially near the motors’ mounts where the structural stress is greater. Switching to aluminum would finally put an end to a recurring issue found within the Phantom family. Clearly, DJI fills every segment of the market from the $100 Tello toy drone to the $1,500 Phantom 4 Pro. Many drones also come in several variants (Pro, Pro+, V2, Platinum, Advanced, Alpine, Obsidian, etc.) with different specifications to occupy every price slot. But there is a big gap between the $1,500 Phantom 4 Pro and the $5,000 Inspire 2. A Phantom 5 with interchangeable lenses would make sense to act as a Phantom 4 plus or sub-inspire 2 drone. Price-wise, DJI would probably bump the current Phantom 4 price by a couple of hundred dollars in the $1,500-$2,000 region without a lens. Then, extra revenue will be made with the sales of high margin lenses. I would expect the lenses to cost around $200 to $400 each with a discount for the full bundle as DJI does with the set of DL APS-C lenses for the X7 camera. The new Phantom 5 bundle with the interchangeable lens camera would occupy the now empty $2,000-$3,000 price segment and create new sales opportunities between the Phantom 4 Pro and Inspire 2. 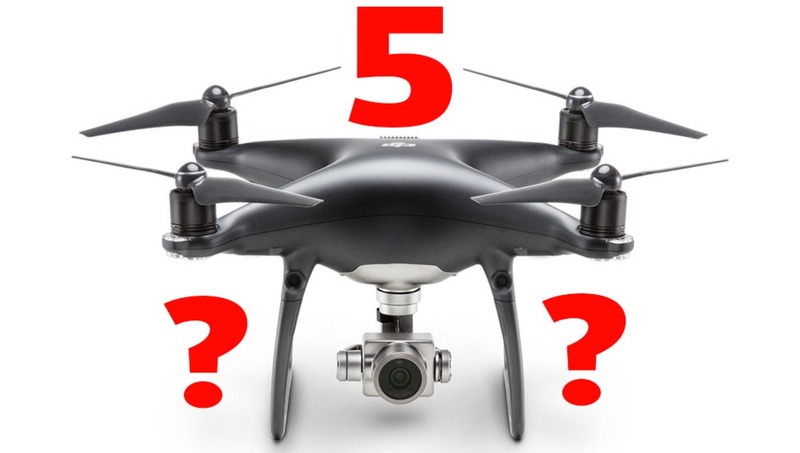 Wouldn’t the Phantom 5 Cannibalize the Sales of the Inspire 2? When the Phantom 3 and Inspire 1 were released, both aircrafts carried the same 1/2.3-inch CMOS sensor, but DJI clearly moved the Inspire 2 upmarket with the X5s Micro Four Thirds sensor camera. Eventually, DJI matched the professional Super 35 video market by offering an APC-S sensor on the X7 camera. The Inspire 2 is now a professional platform costing around $6,000 ready to film. It captures 6K video in 12-bit DNG raw and 10-bit ProRes. It’s unlikely that the Chinese company will unlock the raw option on the new Phantom. At best, 10-bit ProRes could be offered but the one-inch sensor of the Phantom 5 would still be no match for the Inspire 2 fitted with the APS-C X7 camera in terms of low light performance, dynamic range, and resolution. But image specifications are only half of the story of a drone. Flight characteristics are equally important and the Inspire 2 is miles ahead of the Phantom in terms of speed, wind resistance, stability, and field of view. The Phantom is a great drone but under some conditions, the propellers and the legs can appear in the field of view of the camera while the camera of the Inspire 2 can rotate unobstructed over 360 degrees. These two drones are clearly in a different league and strengthening the Phantom 5 with interchangeable lens capacity would not threaten the sales of the Inspire. What About the Mavic Pro 2? If the Phantom 5 moves this drone family upmarket, will the next Mavic Pro follow the same trend? It would be possible since the Mavic Air now occupies the $500-$1,000 market segment. There has been a lot of speculation about fitting a one-inch sensor on the next Mavic Pro but it would be technically challenging to install a “large” sensor on this light frame. Large sensors mean bigger optic and stronger gimbal motors to handle the load. The gimbal clearance must also be increased and each additional ounce on a small drone translates into reduced flight time. The equation seems delicate, but DJI showed that it was able to manufacture very lightweight APS-C lenses for the X7 camera. Perhaps, the Chinese company could install a larger sensor on the Mavic Pro 2 without going all the way to a “big” one inch sensor. A 1/1.7-inch or 2/3-inch sensor could be more manageable to integrate on the Mavic Pro and still offer significant improvement over the current 1/2.3-inch sensor. Another option would be to maintain the current Phantom 4 Pro alive along the new Phantom 5. After all, DJI just announced the Phantom 4 Pro V2 a few days ago. In some markets outside the U.S.A., including Europe, DJI still sells the Phantom 3 SE so this scenario is not impossible. Finally, the Phantom 5 could come in two variants: a Phantom with an interchangeable lens camera and a fixed lens one. In this case, the Mavic Pro 2 would just feature a modest technical upgrade and remain in the $1,000-$1,200 territory. The game is open. 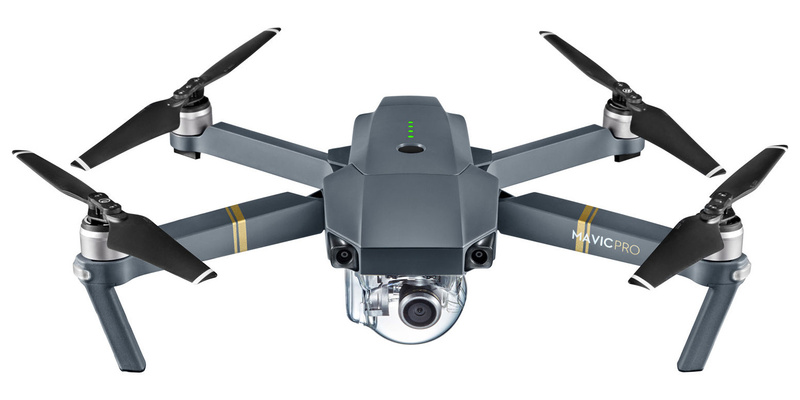 The current Mavic Pro is up for an update and could borrow some features from the Mavic Air (100 mbps bitrate, rearward sensor). The images of a new Phantom with interchangeable lenses come from a somewhat reliable source who leaked accurate information in the past. Yet, in the world of internet rumors and speculation, nothing can be trusted and these pictures, if not fake, could simply show some prototype or proof of concept that will never hit the production line. However, this rumor is plausible from a commercial and technical standpoint. DJI is a very innovative company that is not afraid to push the envelope by releasing ambitious and disruptive products. Stay tuned for the next episode. 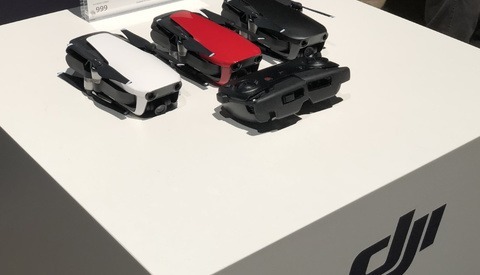 DJI confirms that the images are not fake, the drone seen on the leaked images is in fact a Phantom with interchangeable lenses. DJI says that the drone seen in the leaked images belongs to the Phantom 4 Pro family but does not contradict the fact that it could be a Phantom 5 prototype based on the Phantom 4 Pro frame. However, DPR states (whiteout directly quoting DJI) that “DPReview has learned that those images do not, in fact, show a Phantom 5 at all.” At this point, what “at all” mean is up for interpretation. Does "at all" encompass the entire concept with the interchangeable lenses part or only the drone part which is a Phantom 4 Pro frame? This statement is consistent with what OsitalV posted on his tweeter account before the statement release (which I quoted in the first part of this article): “DJI said that the leaked photo of P5 is a customized drone for designated users, not for sale.” If anything, it only reinforces credibility of the source. Personally, I can’t see what type of “specific application needs [for] an enterprise client” could justify the high development cost of this type of customized Phantom 4 Pro. Building a set of lenses and dedicated camera for a Phantom 4 Pro costs a lot of money (camera and optical design, molding, integration, testing). Therefore, it would have to be some sort of very “specific application needs” that couldn't be covered by the actual Inspire 2 or any other drone on the market, and in turn, justify the development cost of this customized Phantom 4. For these reasons, I would not completely dismiss the possibility that this drone is in fact a potential prototype of the Phantom 5 based on the Phantom 4 Pro frame. However, as I mention previously, prototypes don’t always reach the production line and this drone might not be released at all. The mystery intensifies. AFAIK, the Phantom 5 Pro will have interchangeable lens. And that's where the "innovation" stops compared to Phantom 4 Pro v1 & v2. In my opinion there is, or there are some beta tester behind the scenes, and yes this for me is absolutely real. Do not forget DJI has acquired Hasselblad months ago, so they have had a huge boost in the photographic knowledge. The most uncertain thing is the release date on the market, but I think it will happen around the end of 2018. I do not think the Inspire 2 can be canibalized by the Phantom 5, there is a big difference in formats and characteristics between the two camera sensors, 1" and 4/3 + APS-C. Someone could be stimulated to go for Phantom 5 instead of Inspire 2, for less cost, less weight and size, nothing more, nothing of important. Obviously the Phantom 4 series, instead, will have a drammatical sales decline if not sold at a significantly lower price, say under $1000/€1100. Your final bullet is the critical bit. That would be quite an enterprise client to cover the costs of engineering, development and testing. I'd be very surprised if we don't see those lenses, or similar optically, on a Phantom sometime within the next few months. All depends on how much competitive pressure DJI feels. Or maybe not? Addiction is a powerful thing. Getting someone to make the jump from a Phantom to Inspire is quite difficult. From a Phantom 5 @ $2k or $3k (with a variety of lenses) to an Inspire would be a much more digestible jump. Then there's the Phantom 5 Pro to fill the 5 to Inspire gap. There's almost nothing that drives revenue like a lot of tiny little bits of just slightly better. Exactly. The development cost would be far more than an Inspire 2, so if this supposed client needed different focal lengths that would be the much more obvious choice. 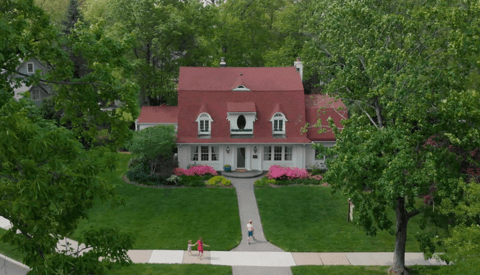 If this supposed client needed both smaller, P4 size drone and different focal lengths, it would still have been way cheaper and easier for DJI to produce 3 additional fixed lenses rather than lenses and a new lens mount.